Remember when we tested and shared how to grow onions indefinitely last week? Well, at the same time, we've been testing out another little indoor gardening project first gleaned from Pinterest that we're excited to share the successes of today — regrowing celery from it's base. We've figured out how to literally re-grow organic celery from the base of the bunch we bought from the store a couple weeks ago. I swear, we must have been living under a rock all these years or just not be that resourceful when it comes to food, but we're having more fun learning all these new little tips and tricks as we dive deeper into trying to grow more of our own food. 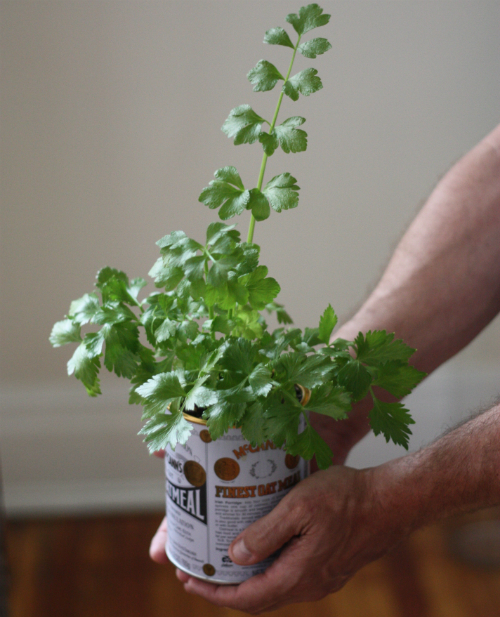 This project is almost as simple as the onion growing project — simply chop the celery stalks from the base of the celery you bought from the store and use as you normally would. In our case, we had a particular homemade bean dip that needed sampling! 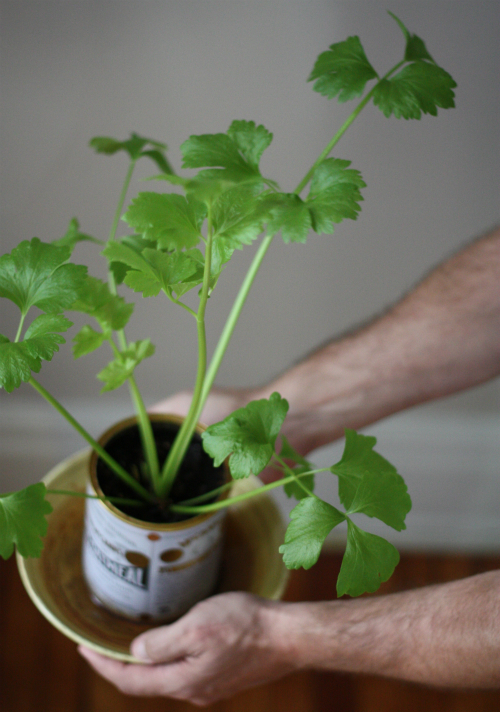 The tutorials we saw showed planting the celery directly into the dirt outside — you may want to go this route if you live in a temperate area or want to be able to harvest outdoors. We went with an indoor planter since it's still pretty cold here in VA, we have limited outdoor space in the city, and the space we do have is currently unprotected from our curious puppy. Find the full 3-4 week update with even more pics and details on the progress in this post. At this stage, we've been actually been able to cut off stalks as needed in recipes and the celery continues to regenerate leafy stalks from the center of the plant. Find the full 5 month update with even more pics and details on the progress in this post. 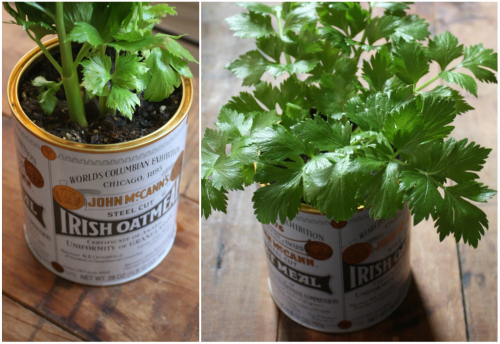 For anyone wondering about the planter, we made it by recycling a tin of steel cut oats we'd since finished. We simply cleaned it out well, then punctured holes along the base to create drainage for the plant. As usual — we'll be sure to keep you posted on the progress of our container celery and hope you'll let us know if you decide to try it out for yourself! 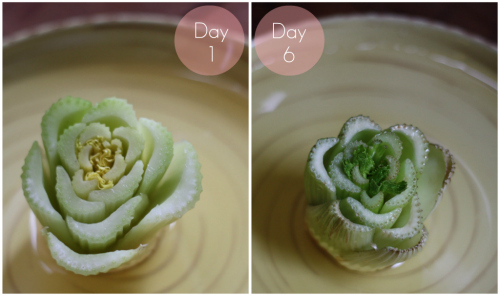 If you've tried this before, what other types of vegetables have you known to be able to regrow itself in a similar way? No.Way. That is so neat! I'm trying that out this weekend. You guys are the best for gardening tips. Now I'm off to find this onion tutorial you talked about. I don't think I've see that one yet. Thanks guys! HA, thanks Angie - we are actually trying it again with bok choy and amazingly it's doing the same thing! Hope to show progress pics on the blog coming soon. I am having a problem- the celery rots and has to be discarded. Have not tried this. Looks pretty. Have done potatoes (not too great) and onions (not successful). Pinched out "suckers" from a tomato plant grow very well. Try potatoes in old tires in the summer. Simply cut the spuds place in the inner part of tire fill with dirt. When leaves start to show place another tire on top, and fill with more dirt. Repeat process until all four tires are used let the leaves grow out of last tire, then knock all the tires over. There will be more potatoes then you can eat. Don't forget 2 water. this is so cool.....I can't wait to try it! How proceeds the celery? I thought this was such a brilliant idea and was inspired to try it. So far so good. Thanks for posting this. Gretchen - so glad you tried it! Ours is doing great as well! We will post an update soon with progress pics, thanks so much for checking in. Would love to see how yours is coming along! Page! Thanks so much for the tip — we keep hearing this and have decided to give it a whirl! Look out for our version coming soon! I'm really excited to hear how to do the pineapple! pineapples turn out great but expect to wait 2 years for the fruit to come and it will be smaller than the original. Look into hydroponic gardening and you will not have to use soil. Awesome tip - we'll definitely give it a looksee! 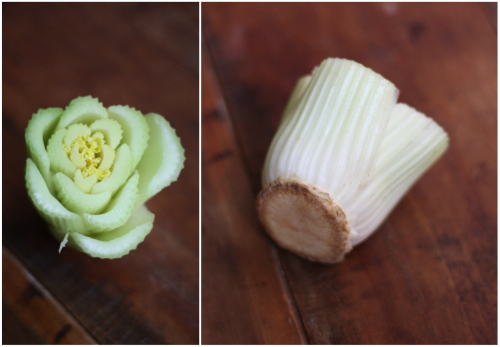 For me, the celery heart is the most delicious. I can't believe anyone would find it a remnant. Good idea, though. Thanks! 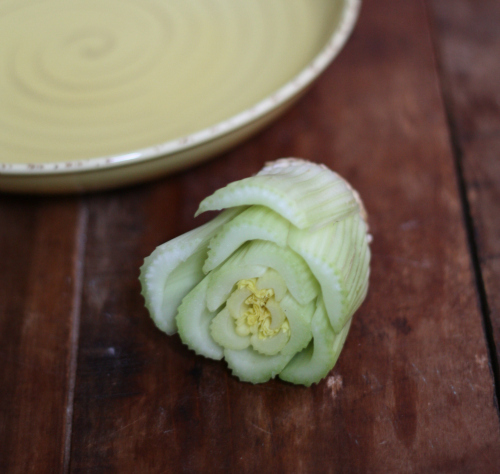 We haven't tried the celery heart yet - maybe we will now! Just a question about the planter -- as you continue to water the plant, won't the metal container rust and be potentially harmful?? This is a good question and something we'll have to consider and keep an eye on as we continue to water and monitor — thanks for bringing this up! I like the can idea. Rust is iron, it's natural. Things that degrade are healthy. I'd be more worried about leachates from plastic. I work at a mom and pop restruantant and I cut up a few stalks of celery a day. Is there a way that I can save the stalks till I get off work? Just toss them into a plastic bag with a moist paper towel and they should be fine until you get home. Hey naturgirl - that's awesome! You should be able to keep the celery bases in a plastic zipper bag or tupperware for safe keeping until you get home and it should still work fine! Good luck! It won't hurt to set the stalks aside until you get home. My mom taught me to let most vegetable roots(celery, carrot, potato, etc) dry out & 'scab' over before putting them into the water to start them - it cuts down on the tendency for them to rot & they seem to grow roots quicker. Sorry I have to do this as anonymous, this doesn't give me an option to sign in that I use. Can we see the progress now? Yes! We can post another update here on the blog soon! You can't be serious.... I really, really have enough going on in my life and now I have start growing celery? And read another great blog? I guess I'm going to cancel all plans for the rest of the week and just keep reading! Thanks for your kind words, Claudia — we are thrilled you like the blog and will be keeping up with our adventure. will certainly try this tip. I just dashed to the fridge to cut the base off of my celery. Not knowing this simple practice makes me feel like my school system failed me. This is such a fantastic thing to do at home! I use very little celery at a time and we only get them in huge bunches in the supermarket. It would be perfect to grow my own and snip off some as and when needed! that is exactly my problem with all those things, parsley, cilantro, dill etc... at least the celery seems to freeze pretty good! if i keep it in the house, are there no bugs? and can i grow it in sand? Maybe a silly question, but could you do this with iceberg lettuce? We've heard you can do it with romaine and other lettuces, so I think it might be worth giving the iceberg a try! Let us know if you try it and if it works! I love this idea and have some started. My stalk is a couple inches and close to being ready to plant in soil, which brings me to my question. I looked into conditions for growing celery and found that it takes a long time to reach maturity and likes very wet conditions. I'm in Michigan so I'm wondering if I would be better off planting it outdoors where it would get more sun than indoors, but might not reach maturity before cold weather sets in. My soil is pretty dry so would require some amendments outdoors. If I go out of town, it might be easier to assure it doesn't get too hot or dry inside than outside during a dry spell. Any advice you can give me to get it to maturity would be appreciated! Thanks! PS. I have some romaine in a saucer now and so far it shows no signs of sprouting. An update to my post from yesterday... My romaine has sprouted and grew to almost an inch overnight. I'm anticipating great results. Looking forward to planting both directly into my garden. It is amazing how resilient plants are is it not? So happy things are going well and hope you will stay in touch with us and the progress. Ok, I have been doing this and so far so good. My celery is getting so tall. My question is when I get ready to use it again, do I pull it out of the dirt and cut and re-plant or do I just cut off what I need and it will keep growing? Thank you for your advice. Sonyia, sounds like you are having some great success. We have not gotten to that point ourselves. We are thinking that we will cut the stalks as needed and see what happens. If you get there first please let us know how things are going for you. Good luck! How long before stalks can be "harvested" for use? Well we have learned that it typically takes 5 months. Our latest updates are coming at the 2 month stage. Let us know how things are coming for you. I just tried this same thing with Romane Lettuce and in 2 days we have sprouts. Now what do I do?? We would continue changing the water and keeping that fairly clean for the next week or so. If your climate allows and it is still cool in the evenings we would transfer it outdoors making to keep the soil watered. Let us know how things are going. Good luck! CurlyT we are so glad you found our little world and we are so happy you are close by here in good old rva! Feel free to contact us with progress on your growth by sending pictures to 17apart@gmail.com. You really made our day letting us know we inspired you. Thanks so much for following and please stay in touch! So glad you are trying this out — that's fascinating about trying to find organic food in Japan. I hope you'll keep us posted on how your plant progresses! We know exactly what you mean! One little project soon turned into a window garden! Have heard that celery will spread like a flower, if you want it all tightly bunched, place a liter pop bottle (we never have any) around it like a sleeve—sans top and bottom—cut them off. I wonder if tying with twine would work? Seems wasteful to have to use a pop bottle—then cut it off? Anyone know more? Wow, love your idea for helping them grow vertically with a pop bottle — we may have to look into this! To keep the celery vertical, I use milk cartons. Because celery likes the light, i cut the carton down to just a band and slide it up or down to help hold it. Or i use plastic milk containers. If you use anything dark it is a form of 'bleaching' which means it is just lighter in color(does not harm the celery). The plastic help heat the celery, so if you are in a cooler area it is better to us. I live in the Yukon and grow my celery outside and the plastic helps alot. I have never grown celery indoors, but definitely going to try this. buy a bottle of coke and use it to clean your toilet. havent tried it but it seems to work! Rah! I'm so excited about this! And I'm so glad I found this blog! Yay! We are so glad you are here too Elysa! Thanks for dropping in! This is a great project. Remember that the whiter stalks are tender enough for crunching on, while the darker ones are better for cooking or juicing. Commercial farmers will cover the stalks while growing to keep them lighter colored. If growing at home expect to use them in cooking or juicing, which is great! Additionally, loads of things will grow from their hearts, like carrots, beets, potatoes (think root vegis), and most legumes and beans (like lentils, wheat, even garbanzos) will also sprout, making a tasty treat. Keep up the great work taking photos of these projects. It is so encouraging! Mouse9, thanks for all the amazing tips — you are inspiring us to try our hands at more projects! Great tip, thank you! Will definetely try this! How much will grow? will i need to plant again? Hey there! If you are able to stick with it for about 5 months, they should regrow completely! You can plant once in soil once it starts sprouting from the water!! Good luck! What beautiful photography and tips. Thank you for sharing. I'm going to try one inside and one outside and see the differences in growth. Found you on Pinterest and I'm so glad I did. I'm a new(ish) organic gardener with severe heart disease. I'm trying to grow more of my own food also! My blog will be linking to yours. Loving the idea of testing two head to head inside vs outdoors — please keep us posted on what you find! 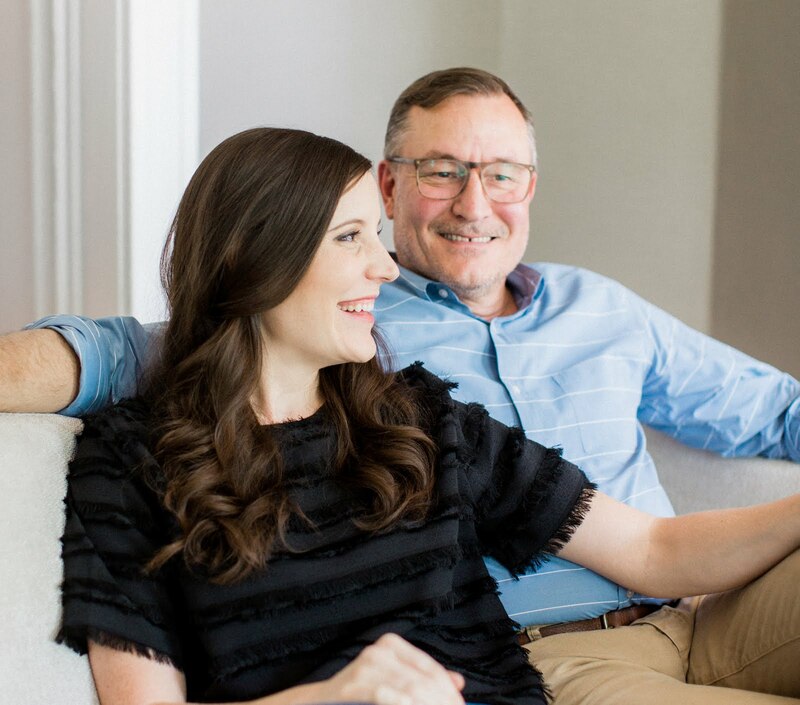 So glad you are here, we are so looking forward to checking out your blog! Thanks for sharing this! So want to try! I'm wondering what some others have asked. Once mature, do you just snip off or do you harvest the whole thing and start over? Hey Michael — so stoked to hear you will be trying this! We just love our little "indoor garden!" REally jealous that your celery grew. Mine looks great indoors, but when I put it outside, it dies after 2.5 weeks! Might try yet again. Oh no! Yes Julia, we hope you will try again — maybe leaving indoors is the solution. I took mine out after a month and it also died. Definitely need to keep in indoors. We live in Central Florida, getting some frosts and freezes here and there in the winter and having a very hot, humid summer. We tried this last winter outdoors as our winters are overall very mild, probably mostly ideal for celery. It worked until the humid spring or some other reason they died--don't know why. Will try again this fall and see if that helps and will also try in a pot to bring in and out as needed--maybe bring ours in during the summer? you don't have to leave them indoors, but you do have to harden them off which means put them out on a porch in the shade during the day and bring them in at night for a week, then u can plant them in the garden. also you have to keep them most at all times. you cannot let them dry out. According to Julia McGruires post, it may be that I should keep my celery indoors? Do you think? I think you might be right! We have kept our indoors and it's still going, so leaving in the windowsill might be the trick to this one in our climate area! I didn't read all the comments so maybe someone asked this, but I was wondering iif you've tried growing carrot greens from carrot tops? I just got some carrot tops started and I am wondering if they will grow indefinitely as I trim pieces off or if they will stop. Just tonight I put my celery in water...can't wait for results! SuperSAHM — we haven't tried carrot tops yet but love the idea! Please keep us posted if it works out for you! Awesome Fai! Let us know how it turns out for you! This was a great tip! Thanks for the tip. I'm definitely going to try growing celery indoors. 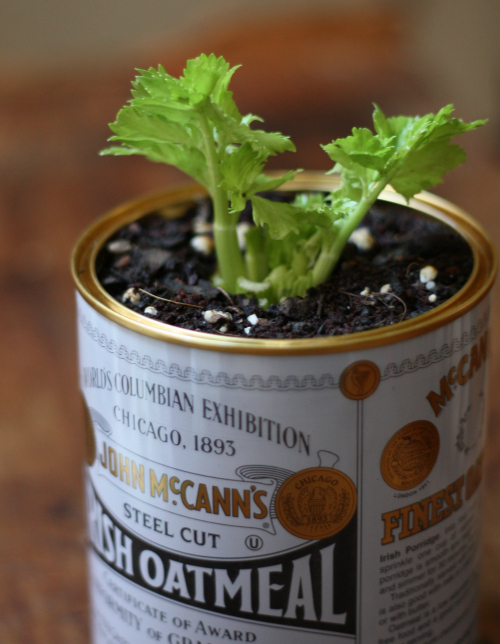 HI i would love to try this, but my grocer doesnt carry organic celery... so if i take non organic celery and take the base and plant it, will it grow organic celery? And when i grow it, i plan to not use any pesticides. Great question. Using non-organic celery will absolutely still work with this project, though it won't technically qualify as organic if you start with a non-organic base. We love the idea of not using chemicals in the re-growth process though — good luck!! The chemicals that were sprayed on the celery originally and the artificial fertilizer that was used will wash and leach away over a very short time and it will then be organic as long as you continue to treat it that way. When I do the the celery is very tough. Any suggestions? We are not sure as celery has a lot of water content typically. We did have one batch fail so we tried it again with success. Hope this helps! keep it wet and you may want to wrap newspaper around the whole thing to keep it young and tender. I can't wait to try this! What an awesome tip! You are welcome keep us posted with your progress. Nice idea, certainly - if one does not want speedy results - but I am most intrigued by the idea of buying oats in a steel container. That seems to undo much of the good work done elsewhere. Can't oats be purchased in a paper or cardboard package where you are? Steel seems to be missing the point somewhat! Thanks for stopping by and yes that was an extravagant purchase of oats in a can. We typically do not purchase oats that way but did fall in love with the design and marketing of it. We were so happy to find a use for it beyond its original intent of which we are still enjoying. I did try this - on week and 1/2 - it's working great!! Thanks for the info! Hi Tim and Mary! 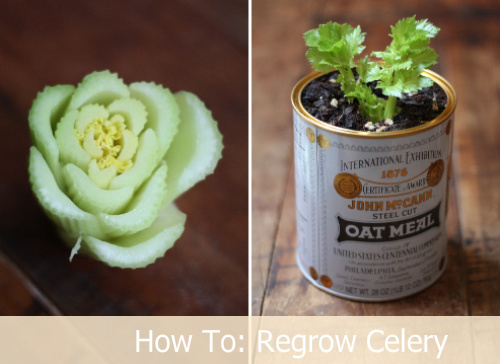 Have a look at our post about regrow celery, we mentioned your blog. Such a great idea! Thanks! GAARN we are headed over to check that out right now.Thanks so much for your kind words and we hope to see you around here on a regular basis! I want to know once the celery grows big enough, can you just cut off a stalk or two as one would need to cook and then the celery starts to grow again? Yes, you can just cut the stalks off as needed and it should continue to grow! Thanks for the info. This is a great thing to know. I like to use celery leaves in soups and stews. The leaves have a much stronger flavor so it does not take as much. I am going to try this and the onions as well. I think Iwill be able to harvest celery leaves much sooner then 5months, but I'll then have to see if it still keeps growing. 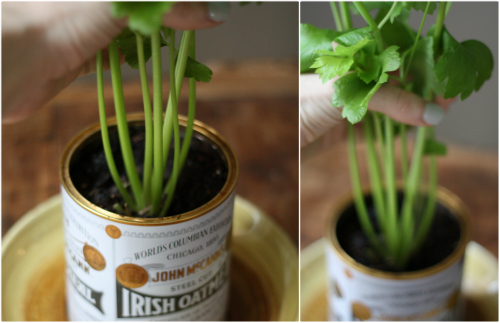 Thanks for the tip on the celery leaves Jen! Keep us posted how it goes and how quickly you are able to do it, any tips are welcome! Read this just after purchasing (and planting) 4 heirloom celery seedlings- I feel a bit stupid for not thinking of this first! Will have to add to my current lot! Wow, heirloom seeds sound amazing. 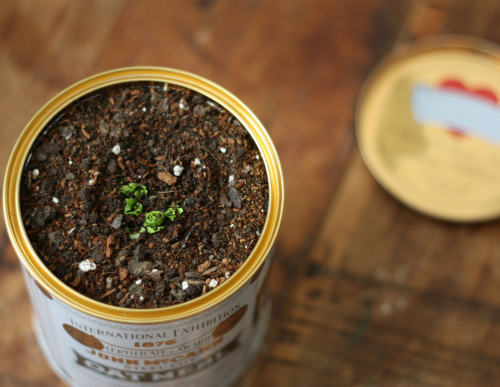 Once those seeds produce plants, just think of how you will be able to replant as you need! So glad you might give it a try — they will love watching it grow! Yes, we have just been cutting off pieces as we need them or to just prune and the stalk just keeps producing from the middle again! Ok cool! !Thanks for the info. Hi there i live in miami,FL. there is a lot of sun n humidity, i worked my celery for 2 weeks it was growing well but for some reason died, so i replant another mixing soil with some munch, to see if the other level of thriving will go up, my question is how much water daily we have to feed our plant??? or any other suggestions to plant it, i see by just living it water works very well hydroponics without the soil. whats your best advice to keep growing it when is 5 inch tall??? Great question — we live in Virginia and have left ours in the potted planter and indoors with a large saucer under the pot. Whenever I notice the water inside the saucer is completely dried up, I add a little more water down the center of the celery. It's been happening daily as the plant gets larger! Just reading this now after replying to a few posts up--also living in Florida...check my reply. Maybe I didn't keep mine wet enough. I planted in sun and shade and some in the ground, some in pots and all outside didn't make it. Could be not enough water as I think more about it. The Celery Heart is where most of the good vitamins are located. This makes total sense — great to know! Ha, we feel the same way! So glad I found this! Do you know if this will grow indoors without direct sunlight? I don't have a window that allows sunlight in. Not sure if it will work without sunlight. It doesn't have to be direct light, but if there is anywhere a little light peeps in I bet it would work. Good luck! Hey Roscoe — it's definitely been right about 5 months for us before we were able to use substantial stalks. As it grows, you can chop off the skinnier stalks here and there to use in soups, stews, and salads as needed! This is great! I have a wilted head of celery in the fridge, that I might try it on. No harm done if it doesn't work. I already know that I can perk up my lettuces, celery, and carrots by soaking them in ice water for an hour or two. I can't wait to see if I can get the base of the wilted head to grow! Adrienne — ours was an old stalk too — I bet you will be able to do it. Keep us posted! It did amazing! I was so surprised at how quickly it put out its leaves. I just planted it in the soil at just over a week and already, the plant is a good two inches tall. Woo hoo! Who knew you could get so excited about celery?! Thanks for all the pictures! I'm just getting into growing indoors, since summer is quick to leave in Canada. It's great to know it'll survive regardless! 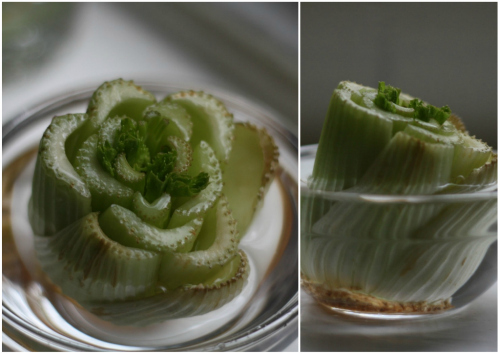 This is probaly the most awsome post about celery growing I've ever seen...the images make it impossible to resist and I'm going to start today! Thanks Meital! Keep us posted on how it goes! Now I finally have motivation to eat that steel-cut oats I bought 5 years ago. I was told that this will not taste like celery, that it isn't edible like regular celery. It that true? We have actually found that these celery stalks have a much MORE flavory celery taste to them — they pack a big punch and have been working well chopped into small pieces for salads and soups! You guys sure have kept this post going! I am interested because I use just a little celery, maybe a rib per week, and I am tired of wasting the rest of the bunch. I was wondering if anyone has tried planting a mature head (minus a rib or two) in either soil or water first, then soil. It seems as though since you are able to cut off stalks as needed from your regrowth, I may be able to cut off stalks from the original as the regrowth is happening. Any experiences or thoughts? Thanks for stopping by! It's worth a try planting, but we haven't tried it that way so aren't sure if it would work. Our celery base was pretty old when we started so maybe once you have the base from the one you use you could try it! Does anyone now with successful results now smile when they see marked-down celery due to near-term "expiration" at the store? I decided to give my idea a try after posting. After two weeks, I figured I had not seen any growth, so it must not be working. I had a moment of clarity when I realized the same celery in my fridge after two weeks would be limp and rotting. I am nearing a month later now and my mature head purchased at the market is still vibrant, growing, and I have answered my question in case anyone is interested: yes, you can plant a mature head for convenience if you do not go through much celery. The advantages have been great, aside from having fresh celery when I want it. First, even though growth is slow, as it is with the bare-cut-stem method this article is about, planting it in soil has helped keep it fresh many times longer than it would have if it were in the fridge. I imagine I can keep it fresh indefinitely in a pot on my window sill. A few of the store-cut shorter stalks on the outside have died out, but the other "main" stalks have been growing leaves and small stalks similar to the pictures of month 5 above, except that it seems to be happening more quickly, probably because the water and nutrient delivery system is already mature. This is especially true for the stalks in the center of the bunch. I find this success especially interesting because there are no roots that have sprouted from the bottom of the base. This has been very cool. So, the verdict on my home trial is that if you use a lot of celery, this is worthless for you. If you only use a little, this is great. Plant your mature head in potting soil after you bring it home from thre market and use a spay bottle to water it down the center stalk and moisten the leaves. Now, if I can figure out what to do with the green onions next to it that are getting a bit unruly. I just moved to Charlottesville; I will reach out to you guys if I find myself in Richmond. Thanks again for this post! What a great post! Thanks. I love the pictures. 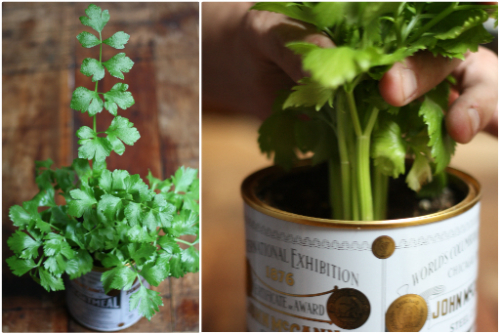 Right now in my kitchen, I am regrowing my own Celery. I also got the idea from Pinterest. So happy to hear and we hope you have great success! I've tried this twice, but each time after getting wonderful growth, it seems like the celery base starts to decompose and the small stalks get limp and droopy before shriveling sadly to their demise. The first time I gave it a try, I tugged lightly on one of the droopy limp stalks and it just slipped right out of the base and soil. Hmm..we definitely did not have this issue. If the soil seems to sink below the stalk we would suggesting adding more soil to keep the base covered. Good luck on your continued efforts! 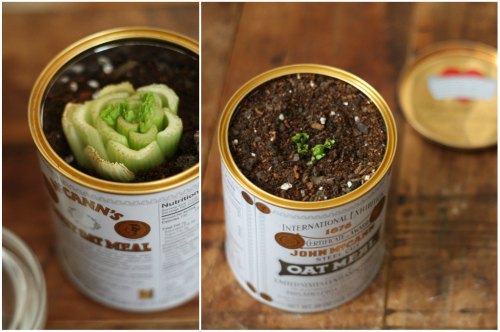 This is such an awesome idea and I certainly plan to take what I have in my refrigerator and plant some this week. Great idea! 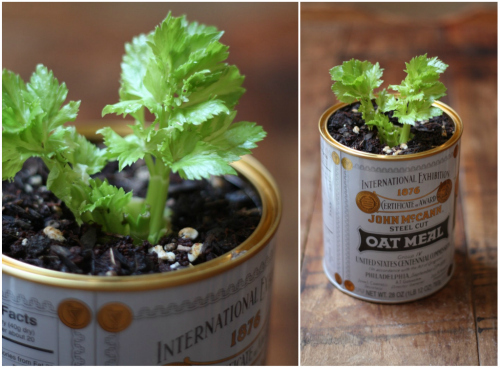 I love the recycled oats tin! I don't think we have that brand around here or I'd likely buy them just for the repurposing possibilities! We are the same way Rachel — too funny! Awesome Margie — good luck and let us know how it turns out! That's really inventive! Thanks for sharing. I shared it on facebook for my readers. Todd — thanks so much for your kind words and for sharing! We're looking forward to also getting better acquainted with your gardening blog! 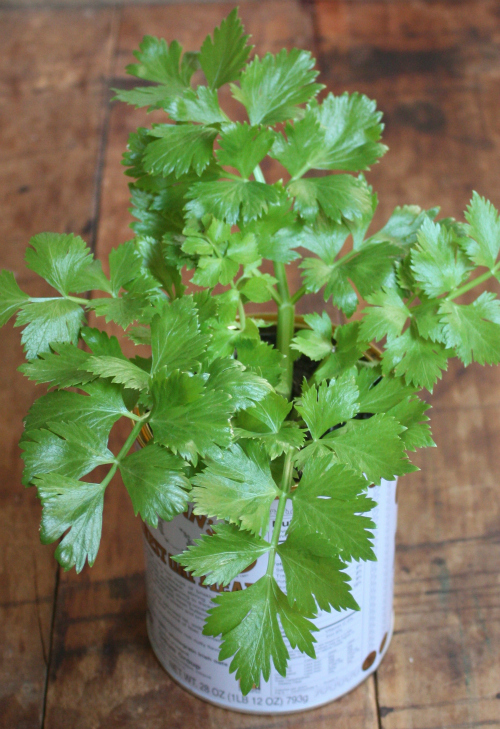 If celery attempts have failed, check if the water you're starting with is getting too much sun and may need to be kept in the shade to keep it from getting too warm/hot. I eventually planted the base, it branched out with more leaves than stalks and started to send out small plants on the sides of the base. This took three four months. These I've re-potted and now happily have three. Have cut them back several times for salads and they just keep coming. Am trying parsley now. Garlic suggestion: When my older garlic bulbs started to send out little shoots, I planted 15 of them closely, about an inch apart in a 6/7"pot. Within a couple weeks long green shoots appeared which I use for milder garlic flavored dishes. I've cut them back three times now and they still keep coming...very much the same as the green onions. Thanks so much for those tips and advice! Sounds like you have lots of experience with these! Thanks for stopping by. This is awesome. I definitely will give this a try. I go through celery like you wouldn't believe. Great Joshua, good luck and keep us posted on your success! Gosh - This is so cool,worth trying. A very useful and everyday required ingredient. Thanks so much we might just give that a try to go with our avocado plant! I am trying the celery indoors right now and have a hearty growth of leaves with stalks growing nicely. I have learned more tips from this article and have covered the base completely with soil. Even with the way I did it, I do have enough of a stalk to use, plus plenty of leaves to work with. I am going to start another...use one as the other grows!! My house plants are now edible with no worries since they are actual food...natural food! My purple thumb is turning "green"! YAY ME!! So awesome, so so so glad it's working well for you! You are sooo creative and inspiring! Love your whole site, thanks for posting!! Hu, I'm amazed how easy to regrow this plant. Thks for sharing . Thanks for posting this. We have one sprouted in water, going on about two weeks and had wondered about planting it in soil. I have seen roots on celery stalks before in the refrigerator and wondered whether this was possible. Should have tried before now. I have grown pineapple before. My experience has been it needs a large pot. The larger the growing room for it the larger the fruit, but I have never grown fruit as big as in the store. I read for the fruit to be as big as in the store the plant needs to be about 6 feet in diameter. Incredible if true. Once the pineapple had produced a fruit I have not been able to get it to produce a second one, except from the top of the new pineapple. One summer I tried growing pineapple directly in the garden (in St. Louis), but it did not produce anything before frost came in November and killed it. Good luck Gary keep us posted and thanks for stopping by! Don't be so darn cheap. Buy from the store. At about 4 in. tall, my celery was looking great when suddenly it was droopy and turned yellow. When it obviously not going to live, I pulled on a stem and it just fell off. I pulled the base out of the pot and it appeared to be rotten. How much water does it need? I really only watered when the soil felt dry. Oh no! We water a little bit each day and keep in a windowsill — this seems to do the trick for us! thank you so much for the info, i will try this with several other growing experiments this winter. in ohio & will then transplant outside for summer. if this works i may expand on winter starters, will keep you in the loop, thanks. Awesome! Can't wait to hear how it all pans out! Also I got 4 stalks of lemon grass to finally root & put out new stalks by leaving them in a jar of water in my sink for months (!) (Yes, I had to explain it & defend from over-zealous tidier-uppers; . . . . . change the water every week or so) They didn't really thrive, though they might have with a good strong light (like over a desk, or by an aquarium, but they tasted great when I finally used them. Wow! Sounds like we need a dose of your green thumb! hi, I need help. I tried to do it twice, but once I transfer the base to soil it starts to die. I used a can as you did but it dies after 5 says or so. Oh no! 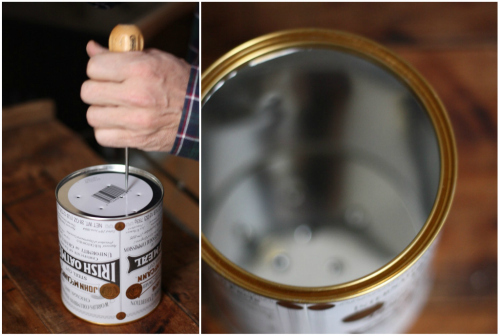 Do you have holes in the bottom of the can? We also place ours in a saucer and just water minimally each day — keeping it in a windowsill. Thanks for this, my first attempt was going ok until I started removing the old bits of stalk around the outside. I put the tapered down new grow in soil and it started to wilt. Now I have only one little stalk of new growth left that I am struggling to keep moist. I have a second one sitting in water with new leaves coming up and this time I will plant the entire thing. Oh good! Keep us posted on the progress! Oh my goodness! I just found this post. I know what my next indoor growing project is going to be! Thanks for sharing this great tutorial. You are quite welcome and we wish you much success! Too funny! So glad to hear similar success stories with this re-growing project! The other day ,on Pinterest,I read that you can also do soething liketh is with ginger. There is also a book out now that talks about the different vegetables you can regrow. Check Pinteresto ut for the title. We will have to look that up! Thanks for letting us know!